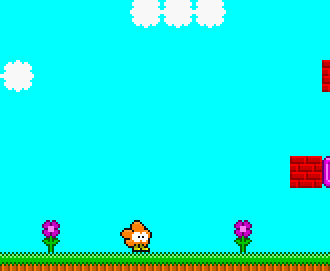 A Freeware Puzzle/Platformer, with a little protagonist in a super colorful world! Use your ability to "evert" to reach the end, and get as many gems as possible! Strongly recommended for people who want a memorable gaming experience! You can download the game here . And now, you can get the High Definition version on Humble Bundle and Steam ! There's a princess that needs saving. Get to it! Now there's even a Level Editor ! "Discover the rest as the game progresses." Keep the spoiler-laden examples on Eversion, please! All There in the Manual: According to Word of God, the main character's name is Zee Tee, an asterisk. The Flower Princess's name is Nehema. Now actually in the manual , as seen on the Steam page. Also, the name of the enemies - Ghulibas. Backtracking: If you want all the gems on the seventh level, you'll need to do this. Badass Adorable: Zee Tee, a cute flower with a Goomba Stomp and reality warping powers! Bonsai Forest: For some reason, trees in Eversion are as short as flowers. They're probably just bushes that look like trees. Bonus Dungeon: After getting all the gems, a bonus Level 8 opens up. There are no gems, and it's harder than the rest of the game, but beating it unlocks the Happy Ending. Bottomless Pits: All pits are large pools of water. And well, it's a platformer, touch the water and you die. But you have infinite lives! Yay! Bubbly Clouds: After your first eversion, those clouds are nifty platforms! Checkpoint: In the middle of most of the levels. Color-Coded for Your Convenience: The background changes colors when you're at an eversion point. How helpful! Easter Egg: In the newest version (as well as the HD), you get a super awesome third ending if you end Level 8 on the awesome X-4 and be sure to collect ALL the gems FIRST! You can also unlock a super awesome bonus title screen if you 100% the game! Everything's Better with Princesses: It gets even better if you get the good ending! Follow the Money: In the first stage already, you can see some gems just out of reach above the clouds. They're hinting that you have a special ability which helps you to reach these gems. Game Over: Averted in regular gameplay, since you have unlimited lives, but after you reach the princess, the game is nice enough to close itself. Genre-Busting: It's a platformer AND puzzle game, with some neat surprises thrown in too! Ghibli Hills: Look at the green grass and blue skies shown in the page image! Isn't it a beautiful place? The HD version also puts nice hills in the background! The Goomba: Your enemies are definitely like this, the first and second types obvious Captain Ersatzes of actual Goombas. Goomba Stomp: Your only method of defeating your enemies. Goomba Springboard: Needed to reach some platforms. Gotta Catch 'Em All: Get the 240 gems and beat Level 8 for 100% Completion! Luck-Based Mission: World 8 in older versions of Eversion. The world helpfully changed which Eversion layer you were on for you, but this mechanic was removed from later versions of the game. Thankfully it came back in the Time Trial mode in the HD port under the title "Old World 8"! Multiple Endings: A bad one at the end of X-7 if you don't have all the gems, where Zee Tee fails to rescue Nehema. But when you collect all of the gems and beat X-8, you get the Good Ending where Zee Tee and Nehema live Happily Ever After! The HD version even has an extra special ending where Zee Tee and Nehema are together in pure happiness forever and ever! One-Hit-Point Wonder: You're a flower-resembling asterisk, so this is kind of a given. Don't worry though, you have infinite lives! 100% Completion: Do this to obtain an awesome new title screen! Rainbow Motif: The sky changes colors at each eversion. Because Everything's Better with Rainbows! Reality Warper: Besides jumping, this appears to be what your eponymous other power does. Retraux: Because classic, simple 8-bit can be better! Save Point: The game will handily save your game after beating every level, as well as helpfully providing a check-point in the middle of the levels. Save the Princess: What you're out to do. Scoring Points: They don't actually do anything, though. Everyone's a winner! Shout-Out: World 1's layout bears a strong resemblance to World 1-1 from the original Super Mario Bros. for the NES. Also, the Steam version has achievements called "The Princess Is In Another Castle", "Metaphor For The Atomic Bomb", and "Beige Alert". Some of the music resembles Cocoron! Sound-Coded for Your Convenience: You can hear the everted world's music at the eversion point; helpful! Speedrun: After completing the game, the game goes into a "time attack" mode where you try to beat worlds as fast as you can. Stuff Blowing Up: Hilariously, your enemies will awesomely explode when you jump on them in later levels! It's a blast! Sugar Bowl: Once again, look at the page image - that's the world your flower character will start his travels in! It gets even better as you go on! Sweet Dreams Fuel: Nearly everything, but the first three or four levels, and possibly the eighth are certainly the most memorable! Take That! : The 'Metaphor for the Atomic Bomb' achievement takes a jab at another Mario-esque platformer with an added mechanic. The tone is evident from the icon for the achievement: Zee Tee and Nehema making the 'awesome' face. Treasure Is Bigger in Fiction: Look at those gems floating in the air. Unwinnable by Mistake: Some level designs can lead to the player getting stuck in one place without being able to get out or die, and the level must be restarted. Some instances of this were corrected in later versions, but it's still possible to purposely enter a unwinnable state in some locations. Fortunately, you can quit the level and restart without losing any of the gems you've collected during that level! Updated Re-release: In high definition! That always happens to video games.